The prevalence and economic burden of low back pain (LBP) has reached an epidemic level and continues to put a strain on the U.S. healthcare system. According to Hoy et al, the overall incidence of LBP is between 1.5% and 36% with incidence of first-ever LBP ranging between 6.3-15.3%. This is a HUGE proportion of the general population and typically makes up a large portion of the therapist’s daily caseload. Through the improvement of medical imaging, physicians are better able to see “what’s going on” inside an individual’s spine, but is this information helpful? Is Medical Imaging the Answer? The accuracy of the pathoanatomical model in diagnosing and treating LBP is severely overrated. Multiple imaging studies have proven this model is limited by the high rate of false-positives. For example, a study conducted by Savage et al found that 32% of asymptomatic individuals had ‘abnormal’ lumbar spines (as determined by MRI) and 47% of symptomatic individuals had no evidence of abnormality. Additionally, Jarvik and colleagues found no benefit with regards to patient self perceived disability when imaging was conducted early in their course of care. So, if medical imaging isn’t the answer, then how do we diagnose and treat these patients? This system was initially proposed by Delitto et al in 1995 and has evolved over the greater part of two decades. Below is a table created by Fritz et al presenting both both the original criteria and the revision proposed in 2007. One of the largest issues with the 2007 TBC system proposed by Fritz et al was an inability to match patients to their appropriate treatment group. An evaluation by Stanton et al in 2011 determined that when a patient did not match a specific intervention, they were broadly lumped into the stabilization category or simply remained unclassified. In addition to this flaw, another study conducted by Stanton and colleagues found that close to 25% of patients met the criteria for at least two of the included treatment categories. In order to address these limitations, Alrwaily and colleagues once again revised the classification system in 2015. This new system breaks the initial triage process into the level of the first healthcare provider contact (direct access) and rehabilitation provider. At the level of the first provider, the patient is directed either toward medical management, rehabilitation management, or self management. This determination is based on the presence/absence of red flags and neurological deficits. 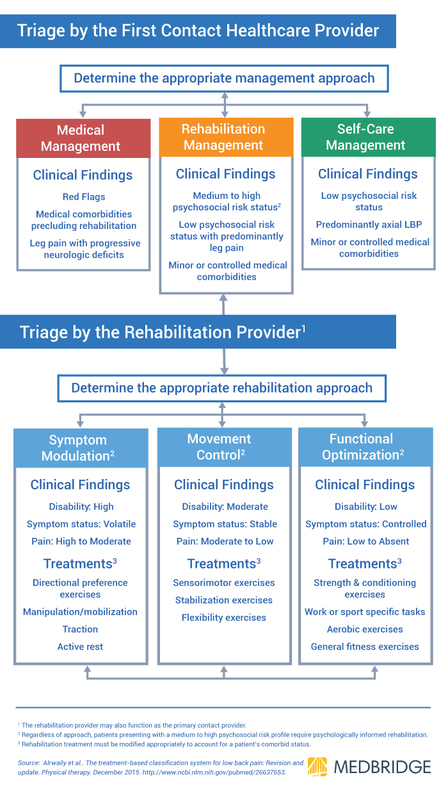 Once the patient has been transitioned to rehabilitation management, the classification categories have been broadened in order to direct patients toward the correct treatment approaches. Instead of breaking the categories into specific interventions, they are now broken into logical groups of interventions (symptoms modulation, movement control, and functional optimization). This alteration will prevent patients from being categorized into multiple groups or not being classified what so ever. In 2000, Fritz et al published a prospective cohort study looking at short-term patient outcomes after matching patient sub-groups to their corresponding treatment strategies. This study evaluated the outcomes of 120 patients receiving physical therapy for acute LBP. While Fritz’s initial evaluation of this treatment strategy did not compare its effects to standard care, it did give some preliminary support to its efficacy. Subjects assigned to the Guideline Group (GG) were treated with low-stress aerobic exercise (treadmill walking or stationary cycling), general muscle reconditioning exercises, and advice was given to remain as active as possible within the limits of their pain. Patients in the Classification Group (CG) were evaluated and assigned to the most appropriate sub-group. Following assignment, they were then treated based on the system proposed by Delitto et al. At the one-year follow-up, mean Oswestry scores approached, but did not meet statistical significance (p= 0.063) in favor of the CG. In terms of healthcare utilization, of the 20 patients who took up 51% of the total medical costs, 13 were from the GG and only 7 were from the CG. This translated into a relative risk of 2.1 for the guideline group and a number needed to treat of 5.5, or an average number of patients who need to be treated to avoid a ‘high cost’ patient when using the classification system compared to the clinical guideline approach. Why It Works: Superior Interventions or the Matching Principle? What if the interventions being provided from the previous clinical guideline standards were simply inferior to the techniques used by the classification group? Would proper pairing of presentation to treatment remain an important factor in outcomes when the same interventions were used throughout the patient population? Brennan et al published a randomized controlled trial that investigated the impact of pairing interventions to the correct sub-group of patients with non-specific LBP. In evaluation of 123 patients, those individuals who were matched to the correct treatment approach demonstrated greater short- and long-term improvements in disability compared to those who were unmatched. Patients in the matched group achieved significantly greater improvements in mean Oswestry scores at 4 weeks (29.9 v. 23.3) and one year from baseline (33.3 v. 26.1). Additionally, 78% of subjects in the matched group achieved progression to stage II of treatment, while only 60% of the unmatched patients achieved this milestone (p= 0.039). This study gave continued credence to the application of a treatment-based approach in the management of acute LBP. Do the Outcomes Depend on a Clinician’s Experience? The above studies give the treatment-based classification system solid evidence-based support, but is it reliable enough for widespread utilization by clinicians? Fritz et al evaluated the inter-rater reliability of individual examination characteristics related to the treatment-based classification system in clinicians with varying levels of experience. Patients were evenly distributed to each clinician category with between 24-25 patients seen by each group. In terms of individual examination characteristics, the inter-rater reliability coefficients were at least moderate for all range of motion measurements, the prone instability test, and judgments of centralization/peripheralization with flexion and extension ROM. However, reliability of centralization/peripheralization with repeated or sustained extension movements and judgments of aberrant movements were fair or poor. The ultimate agreement among clinicians on patient placement within the classification decision-making algorithm was 75.9%, which correlated to a kappa value of 0.60 (moderate agreement). Additionally, there was no significant difference in kappa value depending on experience of the examining therapist. Earlier this year, Henry et al conducted a similar study with 12 therapists evaluating 24 total patients. This small cross-sectional reliability study produced total agreement on classification of 80.9% and a kappa value of 0.62 (moderate-good agreement), which agrees with the previous study by Fritz et al. 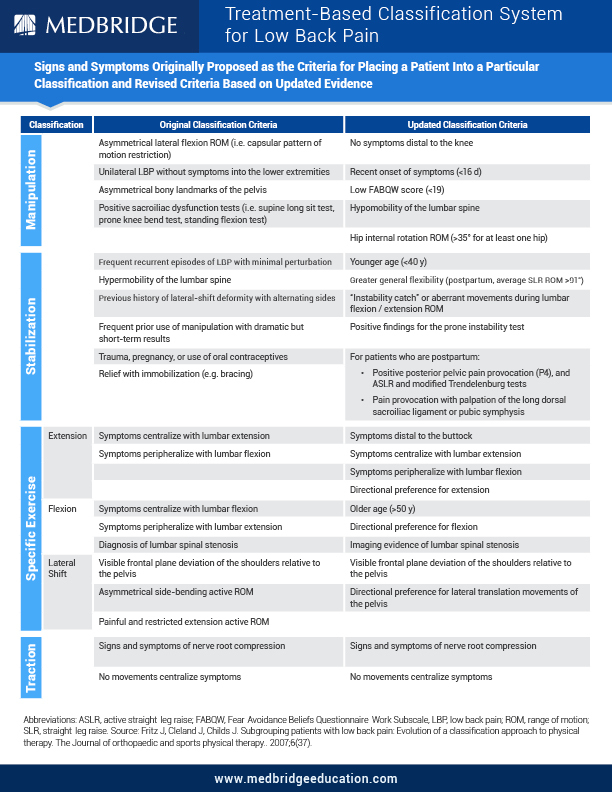 This classification system has been rigorously evaluated and has come out with moderate to good inter-rater reliability regardless of clinician experience or expertise. This goes along with the improved clinical outcomes and decreased healthcare costs seen in two large randomized controlled trials. Currently, this is the most consistent and effective evidence-based tool to evaluate and treat LBP and should be considered a viable option for any therapist. Additionally, as new evidence comes to light, the system continues to evolve in order to accommodate the growing body of evidence with regards to the evaluation and treatment of low back pain. During clinical practice, not every patient will fit nicely into a specific subgroup, but having this framework aids clinicians in making more informed, evidence-based treatment decisions. I appreciate the effort to take on the rather complex and circuitous path that Treatment Based Classification has taken over the last couple of decades; however, I have to address a several issues here with respect to some hasty conclusions drawn from the literature. In particular, the findings of Brennan et al (2006) are questionable on several levels. First of all, these authors failed to address the statistically significant gender disparity between the groups. The unmatched treatment group had a significantly higher proportion of females, who have shown poorer outcomes from treatment for chronic LBP (Polatin et al, 1989). It’s also possible that females may respond less favorably to unmatched treatment than males due to gender-related differences in treatment expectations. Since the unmatched group contained more females, it’s also possible that the females in the unmatched group had higher levels of pain and disability at the start of treatment, but this difference was washed out by males with lower mean pain scores in that group (the difference in pain and disability between groups was not significant). We don’t know because individual subject data is not provided in the published article. A sub-analysis of a bi-modal distribution of pain and disability based on gender should have been performed and the results reported in the article, but it wasn’t. Most importantly, however, was the lack of a clinically meaningful change in disability both at short- and long-term follow up. The long-term difference on the Oswestry Disability Index between matched and unmatched groups was a meager 3.1 points. Again, this difference could be attributed to the differences in gender make-up of the groups, or due to natural history. In any case, it’s nothing to toot our horn about. I’m concerned that the profession has gotten so mired in contrivances like TBC that we will never reach the simplicity on the far side of complexity.